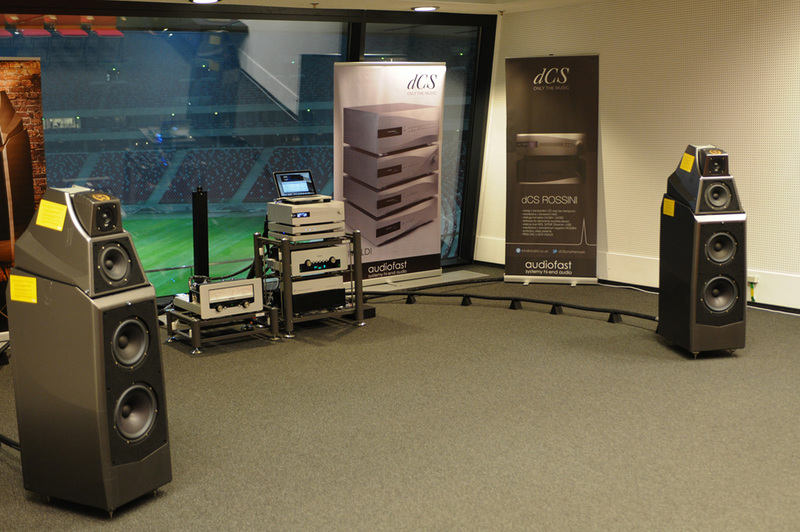 With a dCS Rossini as digital source, Audio Research KT150-based Galileo GS150 power amp and Ref 10 line stage, the exhibitor in this room chose Wilson Audio Alexia for speakers. 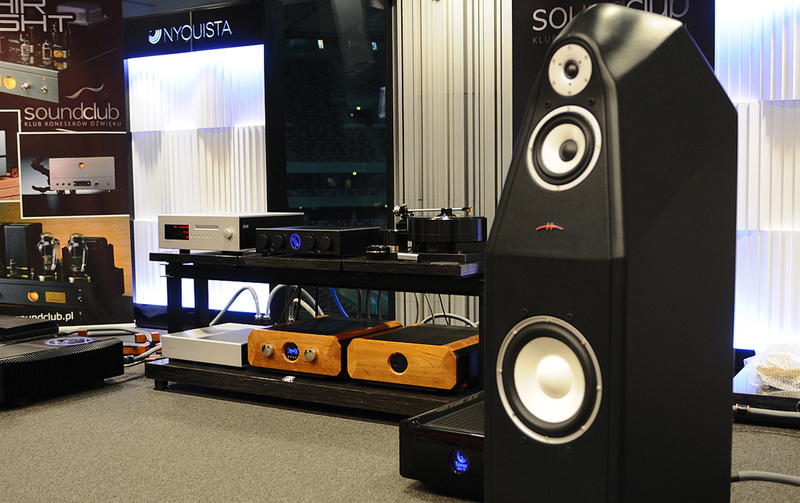 While the room of the same distributor we visited earlier sounded really good, here the to us typical Wilson sound dominated: too much and too bold. On visuals, the Alexia still had the yellow transport stickers attached. Even certain cellophane wrap was still on. We'll spare you our closeups. The devil is in the details. 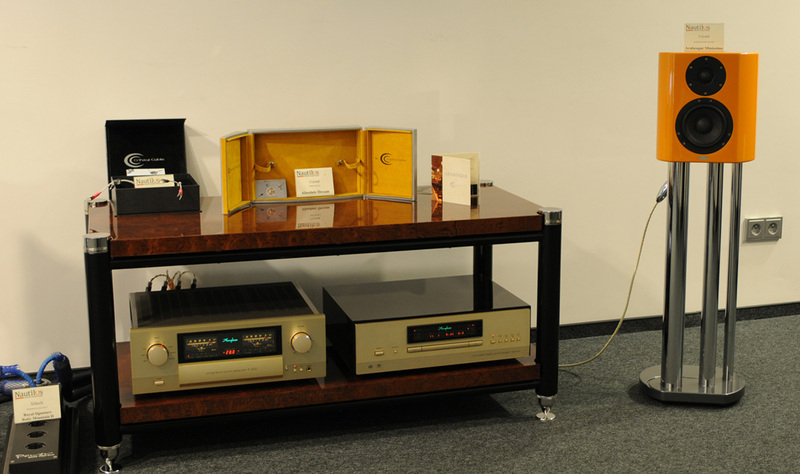 Hansen Audio's The Dragon Legend E speakers were matched with Tenor Audio's 350M HP monos which in turn were preceded by Tenor Audio's Line 1 with its dedicated power supply. We now got a glimpse of what 6moons colleague Mike Malinowski has shared in his Tenor reviews. These composite-cabinet Canadian loudspeakers were masterfully controlled by their equally Canadian electronics. One of our impressions which we cannot prove but which gets stronger year after year is that systems composed of gear stemming from the same geographical region match better than components assembled from different parts of the world. It seems that there is a region-specific tonality at work which nets ultimate harmony when all constituent parts share that same tonality or sonic aesthetic. Anyway, here a big German Brinkmann turntable with its own tone arm was loaded with an Air Tight PC-1 cartridge to perform analogue duties while a Soulution 746 did digital. 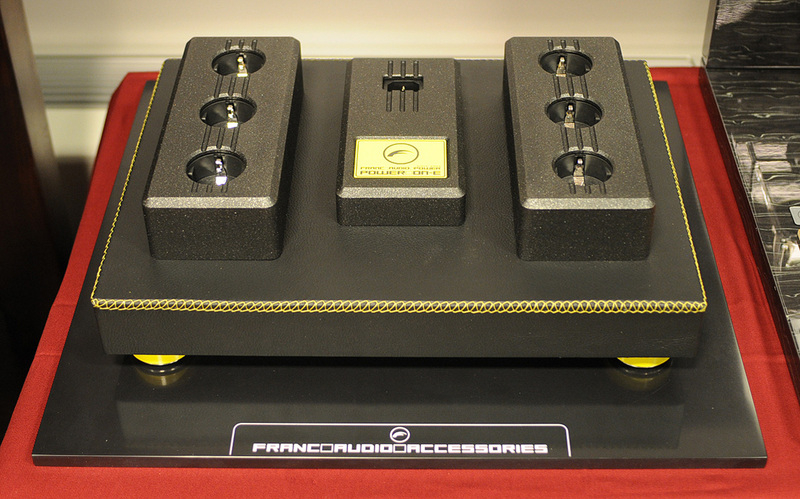 Franc Audio showcased their designer version of the passive power filter clad in a custom-made leather jacket. It worked wonders in the visual sense. Strolling down the spacious and curved stadium hallway, we passed another well-visited headfi auditorium; and then another. Headfi is definitely happening. How then we wished to have taken some headphones with us from one of the previous rooms. 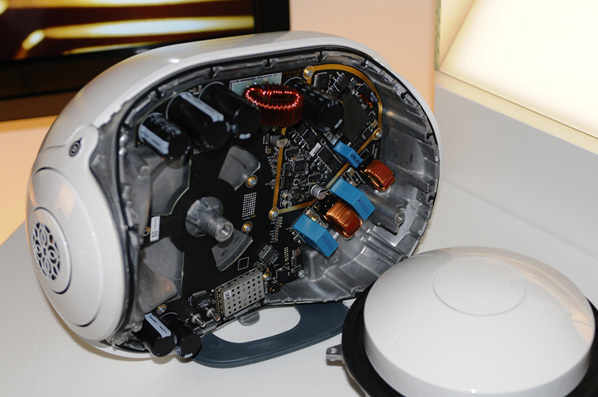 Not to listen to music, mind you, but to protect our ears from what we encountered next in the Devialet room. Aside from the at the time passive display of multi-amped B&W 800 Diamond floorstanders with four Devialet 200 class A/D hybrid all-in-ones feeding them, there was a Phantom "demo". That really was an ear-splitting noise like a jackhammer rattling away at Count Dracula’s dreary coffin. It felt like a moronic attempt to convince potential customers that the über boom box (which is all the Phantom proves to be under such abysmal circumstances) can execute square waves at high SPL without going up in smoke. We escaped this room in a hurry, staying just long enough for a few photos. 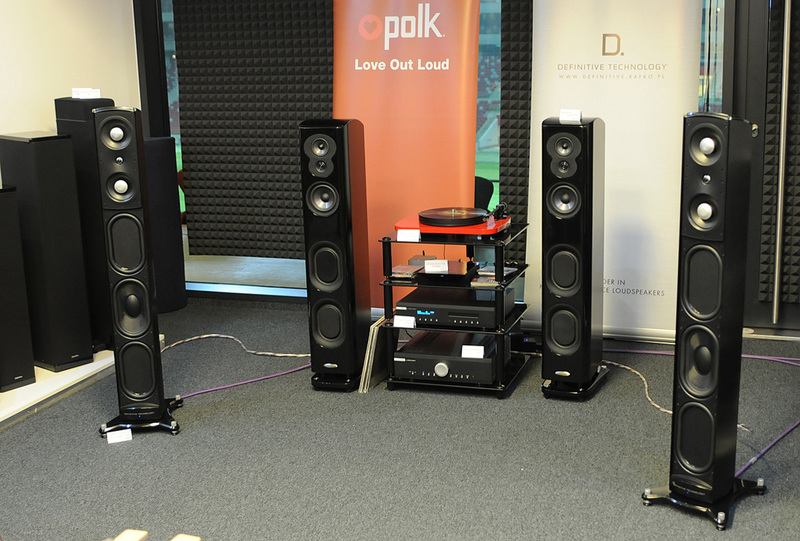 Publisher's comment: Marja & Henk are happy owners of two original Devialet integrateds. Any prior bias thus would be positive. However, their observations of this Phantom demo combined with my earlier one at the Munich show which was just as poor, questionable and seemingly oriented at a primitive audience in love with bassy techno at high levels, one begins to wonder. 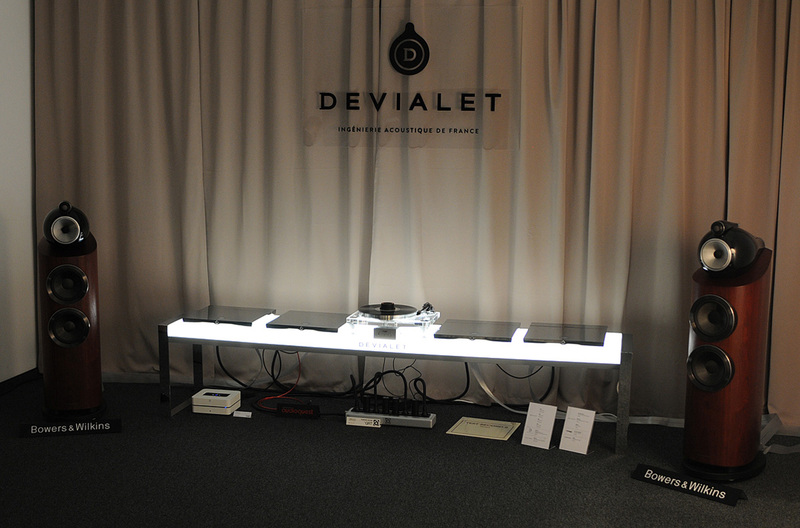 Devialet are one of today's best-financed hifi companies, being under the same luxury conglomerate umbrella as Louis Vuitton. But clearly money doesn't buy trade show savvy. Attending a hifi show with a more ambitious audience whilst aiming at the very lowest common denominator really doesn't seem smart. At least so far it's played very poorly with our crew. Perhaps we're just not getting it? And now for even more headfi! Here we had a stretch which included pageant-sash wearing young beauties to lure solo listeners to sit down and in. But nice-looking young girls were not only here. All over the various show venues, we met them handing out leaflets, smiling at doors or being active as prompters to have one enter a specific room. It reminded us of a show in Moscow we attended many years ago. There girls hired for show duties came from an agency which normally caters to a very different target market than audiophiles (exceptions always possible). 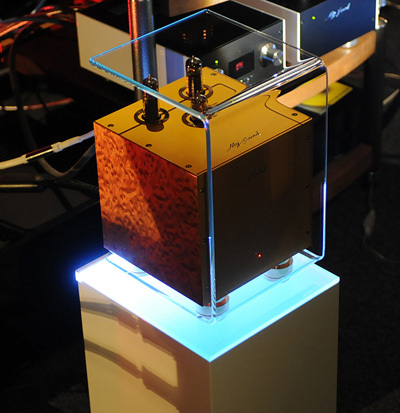 The next room played a Quadral setup with components from their Aurum series. 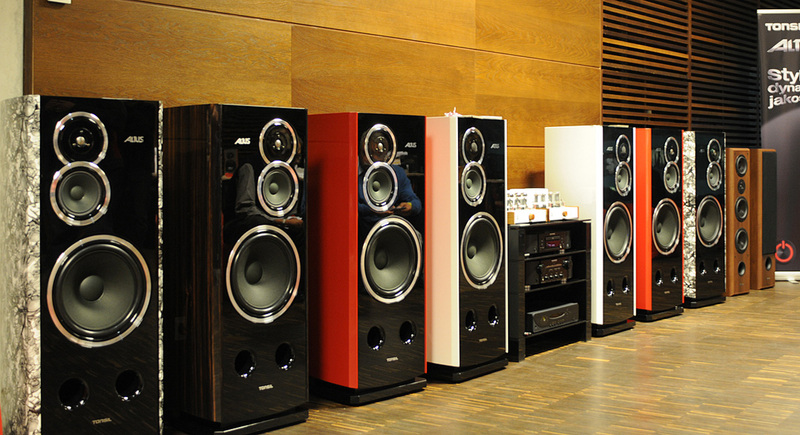 For some reason, we thus far have never lucked upon a demonstration of this German brand’s speakers which appealed to us. This is a purely personal thing of course. Fortunately for this room's proprietor, visitors here seemed to have a different take from ours. Under the brand name hORNS, Polish company Auto-Tech cater not only to the DIY/OEM market but also offer a range of turn-key speakers which are horns of course. For the DIY enthusiast, hORNS can provide acoustic horns, wave guides and other bits and bobs. You like yours bi-radial, spherical or tractrix? hORNS have your match. Want a full-blown bass horn? Ditto. 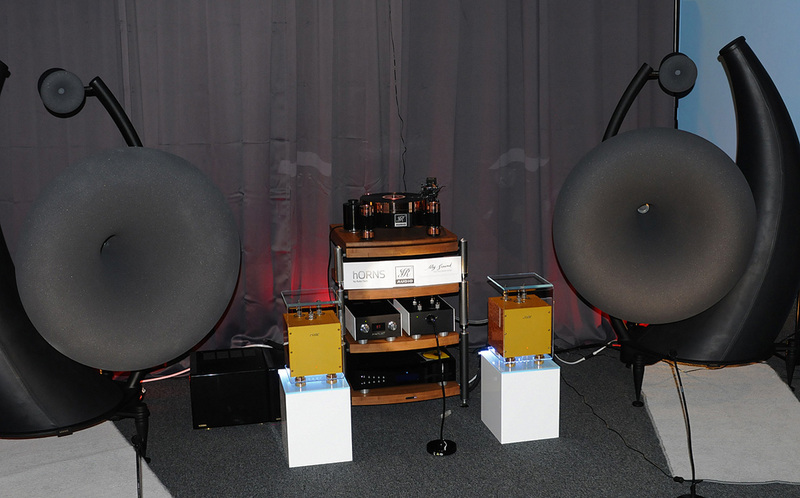 At the show the company demonstrated a Universum 3-way system with 15" woofer, 2" midrange and 1" tweeter beryllium drivers. Rated at 100dB sensitivity, the small My Sound EL84-based 12wpc power amps styled like Swedish Engstrom & Engstrom proved together with the Polish JR Audio turntable that vinyl, tubes and horns are still a great match. And by the way, all of it was Polish here. Polk advertised with Love Out Loud and we hoped that it was only a silly advertisement slogan. We met silence during our visit, perhaps the preferable opposite? More action and adventure were to be had in the Diesis Audio room with their large dipole loudspeakers topped with a horn tweeter and massive round subwoofer. 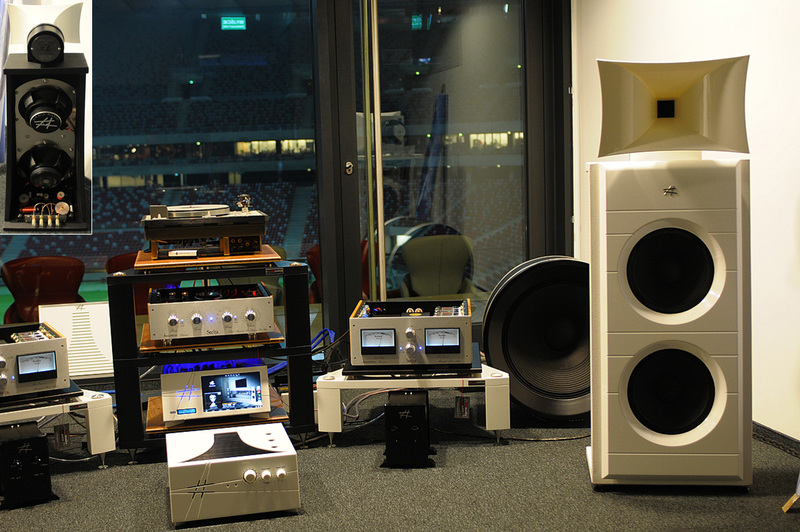 The Corian-clad loudspeaker was the Caput Mundi and the Italian makers run a coaxial compression driver for the mid/high frequencies whilst the open-baffle dipole construction is in charge of the lower frequencies. In the Bonham Tribute subwoofer, we had yet another dipole construction. 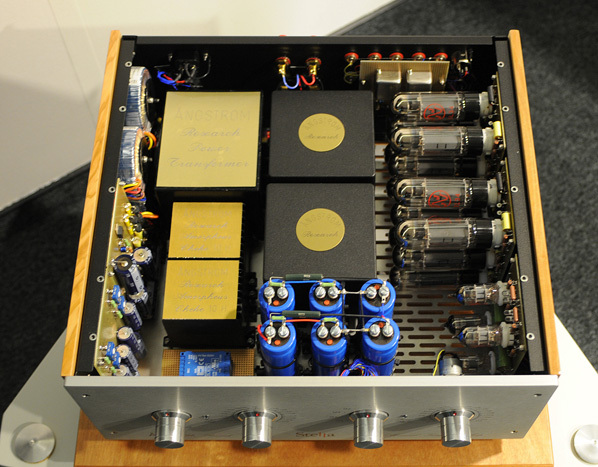 Amplification was in the hands of another Italian company, Ångstrom Research, who provided their EL34-based Stella integrated amp. It showed off classy build quality inside and out and with the danger of getting repetitive and wearing out our needle, this was an all-Italian room. The last active space of our stadium visit became a personal surprise. While deciphering the Polish show catalogue, we chanced upon the word Crystal Cable in a line of brands which a Polish distributor takes care of. 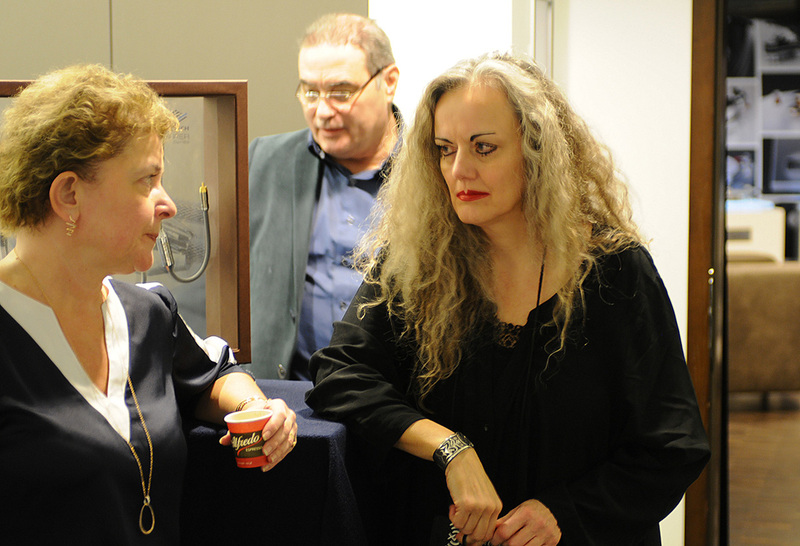 We however did not expect to actually meet Gaby and Edwin Rijnveld, owners of Crystal Cable and Siltech. It is always funny when one meets familiar faces from around the corner of one's home but now hundreds or even thousands of miles away. Yet our conversations picked up where they'd last left off as we had a listen to the Crystal Cable Arabesque Minissimo done up in a cheerful Solar Orange with electronics from Accuphase. Even in background listening mode, the small loudspeakers lost none of their impact or dynamic charms. Only the SPL were low but all audiophile check boxes ticked off. At the end of the hall, the show closed for us with a static display of Polish Tonsil loudspeakers. New this year was their Altus 380 with reworked tweeter and upgraded internal wiring. The Altus with its retail price of ~ €1200 euro looks like a real-world opportunity and already appears to be a popular choice in Poland as we learned. This concluded our first day of the 2015 Warsaw show. Already we felt tempted to say that in its current format, it was more than just the European runner up. After a good third of the show covered and comparing consumer interest between Munich and Warsaw, the winner was Warsaw. And still we had to see what the Golden Tulip and Radisson Blu Sobieski with another 91 rooms had to say about this. For now we took the shuttle bus back to the hotel, cleaned up, had dinner and dreamed happy audio dreams. Here are some comments from show organizer Adam. "I see from your report that you spent Friday at the stadium. This probably means you spent Saturday at the Sobieski. I forgot to tell you to do it the other way 'round. I advise everyone not to go to the Sobieski on Saturday as the hotel is overcrowded with too many people who want to visit at the same time. The National Stadium is much better in this regard. Their corridors are much wider. Even on Saturday when we had a flood of people, it was still comfortable. Incidentally, I’m not sure whether you noticed but the rooms at the Sobieski varied in quality. Some were pretty beaten up—there were 28 of those—whilst another 54 were already renovated. Since acquiring the hotel two years ago, the Radisson Group began to renovate this location step by step. Those 28 old rooms were the last ones left out of the 400+ they have. They started renovating those last ones hours after our show closed so for 2016, all their rooms will look like new. Of course that won't solve the problem of overcrowding. Last but not least, with 145 rooms total, we had 35 more than in 2014. We had 11'214 visitors, another record for us. Munich does about 18'000 for contrast. If the stadium had 140 rooms, I would move the entire event over there. But we already maxed out what they have available this year."